Who was the sponsor of this hole? Well, here's one for you loyal readers out there. A group of alums (called the loyal malcontents by the HQ staff) who consistently give to the foundation (but are not members of the Million $ club) decided they would support the Conclave Golf Tournament and the Foundation by collecting enough money to sponsor a hole. They decided that they wanted to sponsor a hole with a significant sand bunker and call it "Archie's Bunker," in honor of our Grand President. These donors only asked that their donation sponsorship be appropriately acknowledged like everybody else who sponsored a hole as advertised in the solicitation for sponsorship, not by individual names but by the initials, AOG, which is the name of their dinner group that gets together every other year during Conclave. Well, the "Archie's Bunker" sign went up for the hole. Thanks for that. But do you have any idea who really sponsored it? 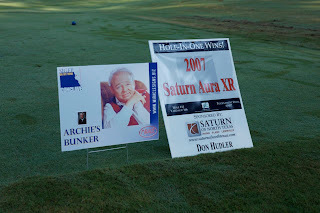 Was it miraclesigns.biz (who apparently printed the sign) or was it Don Hudler and Saturn (who also sponsored the prize for the hole in one)? Unless it's on the back of the sign, there is no mention of AOG. Maybe they should ask for a refund or for their pictures to be on the cover of the next issue of the Journal.